One of Boston’s oldest neighborhoods, Beacon Hill is known for its charming, narrow cobblestone streets, federal style row houses and gaslit street lamps. It’s also considered to be one of Boston’s most desirable and expensive residential areas in the city. A visit to Boston isn’t complete without a stop here. Whether to shop, dine or wander about admiring the architecture and numerous historic sites, there are so many things to do in Beacon Hill. The Park Street Church was founded in 1809 by 26 locals, who were mainly former members of the Old South Meeting House. The church became known as Brimstone Corner, possibly because the area was used for the storage of gunpowder during the War of 1812. In 1816, the Park Street Church joined the Old South Church and formed the City Mission Society, which served Boston’s poor. The church was the site of many firsts, including the nation’s first Sunday School in 1818, first prison aid in 1824, and William Lloyd Garrison’s first public statement against slavery in 1829. Park Street Church can be seen from the various surrounding neighborhoods because of its steeple, rising 217 ft. high. The Old Corner Bookstore, located on the corner of School and Washington Streets, was built in 1718 as an apothecary shop and residence. During the 19th century, it housed the Ticknor and Fields Publishing House and later became the literary center of Boston. Authors such as Henry Wadsworth Longfellow, Ralph Waldo Emerson, Nathaniel Hawthorne, and Henry David Thoreau brought manuscripts here to be published. It is now known as the Globe Corner Bookstore and specializes in New England travel books and maps. 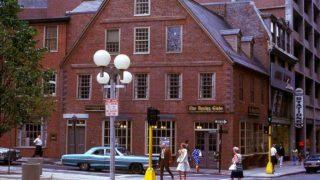 Before the Old Corner Bookstore was built, the original building was the home of Mrs. Anne Hutchison, who was condemned for her dissent from Puritan orthodoxy. Established in 1635, the Boston Latin School was the first public school in America. By inviting boys of any social class to enter, the school set a precedent for tax-supported public education. The Boston Latin School’s curriculum is inspired by the 18th century latin-school movement, which centered on the idea that study of the classics was the basis of an educated mind. Some of the school’s most famous students were Ben Franklin, Samuel Adams, Henry Ward Beecher, Ralph Waldo Emerson, John Hancock, and Leonard Bernstein. A statue of Benjamin Franklin keeps a watchful eye on the site and a mosaic on the sidewalk behind King’s Chapel marks the spot as well. 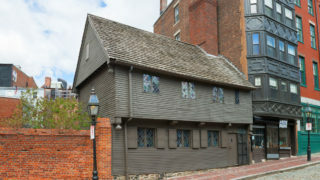 The Black Heritage Trail features various homes, memorials, and sites that are significant in the history of Boston’s 19th century African American community. The first slaves arrived in 1638 and by 1705 there were over 400. At this time there were also the beginnings of a free black community in the North End, and by 1790, the time of the first census, Massachusetts reported no slaves. The trail includes the Robert Gould Shaw & the 54th Regiment Memorial, first black regiment, the George Middleton House, the oldest home built by African Americans on Beacon Hill, and the Phillips School, one of Boston’s first schools with an interracial student body. In the distinctive gold-domed building atop Beacon Hill, the past meets the present. On weekdays, you can discover Massachusetts’ history on a free tour of the center of the state government. The building, completed in 1798, was designed by Charles Bulfinch to replace the Old State House. In addition to housing the state government, the State House also displays various portraits of governors, murals depicting the state’s heritage, and statues inside and on its grounds. The building is recognizable because of its dome sheathed in copper and covered by 23 karat gold, as seen in the film The Departed. Boston Common was established in 1634 and is on the List of National Historic Landmarks. Today, this expansive green space is the starting point of the Freedom Trail and the anchor of the Emerald Necklace, a system of connected parks that winds through various Boston neighborhoods. Its long history includes being used as a campgrounds for British Troops, the site of public executions and the place where several notable visionaries and leaders gave legendary speeches including Martin Luther King Jr., Pope John Paul II and Gloria Steinem. Today, Boston Common is still a place for many public gatherings, festivals, events, concerts and sports as well as a pleasant place to jog, bike and walk while enjoying the pretty scenery. Located at the foot of Beacon Hill. One of the oldest libraries in the United States, the Athenaeum was founded in 1807 and is an exclusive club of sorts in which a membership is required to use the many magnificent resources of this institution. But feel free to visit the first floor of this historic building that is open to the public and is home to an art gallery with a variety of rotating exhibits. Marble busts, porcelain vases, oil paintings, books and more are a delight to browse through and view. There’s also a children’s room with cozy reading nooks that overlook the Granary Burying Ground. The Charles Street Meeting House in Beacon Hill is a historic church that was built in 1807. Its first congregation was the Third Baptist Church, which baptized its members in the Charles River. Before the Civil War, the church was an important site for the anti-slavery movement, used for speeches by Frederick Douglass, William Lloyd Garrison, Harriet Tubman, and Sojourner Truth. The building is currently used for commercial purposes. The Christian Science Plaza is the location of the First Church of Christ, Scientist, one of the largest churches in New England. The plaza consists of 14 spacious and serene acres, paved in brick and granite, with orderly rows of trees, buildings, stone benches, a large reflecting pool and a circular fountain. The Mother Church, built in 1894, consists of a Romanesque Church Edifice with a bell tower and stained glass windows, and the larger Church Extension, added in 1906, is a mix of Renaissance and Byzantine architecture.